A home phone that literally does not cost anything to use besides the initial cost of the OBi unit! I recently switched mobile carriers from an expensive unlimited plan to a smaller MVNO service called Ting. Since Ting charges according to usage, I have made an effort to reduce my usage. To do that I have been using my Google Voice number more frequently and have found ways to utilize it so that the majority of my texts and calls are essentially free. In order to have a dedicated Google Voice home phone I decided to try out the base model OBi100 VoIP device as it was a minimal investment. I thought that having this device wired directly into my home network would be a more reliable way to make and receive lengthy phone calls using Google Voice. 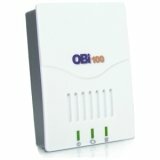 The OBi100 device I bought cost just under $40. This little VOIP box supports one phone jack but can be configured to work with two different VOIP numbers, in my case, Google Voice numbers. Other features include call waiting, 3-way calling, call forwarding, caller ID, and telemarketer/anonymous caller blocking. Essentially the OBi100 is a little box that can turn a regular land line phone into a VOIP phone with easy set-up for Google Voice. After initial setup making and receiving Google Voice calls is just like having a land line. The same company has a number of different models that can turn Google Voice into a VOIP, but for most people the basic model shown here will probably suffice. Call quality has been excellent. I imagine this could vary depending on the quality of your internet connection and your router, but considering the overwhelming majority of positive reviews on Amazon, it seems that this little device works well for most people. The OBi comes with a pamphlet that explains how to set up Google Voice, but it is really pretty intuitive and they even have a step-by-step tutorial if you need it. The OBi device works great as an inexpensive landline with Google Voice. It also can send and receive faxes if hooked up to a fax machine or an older computer that has a modem in it. I have used it to send and receive faxes from my ancient Power Mac G5 and it works perfectly.